Neat shots Joe! Looks like both photo's are San Bernardino, that track had a relatively tall wooden guardrail around it. The 2nd photo looks like the #16 and #15 could Leonard Faas team cars, Perry Grimm and Walk Faulkner (amongst many other top open wheel drivers) drove for Faas. I got to see Walt Faulkner race at Balboa Stadium for my very first race. I am not sure, but I think the Vukovich brothers were there also. First, with the stuff I have I can only go back to 2005. All my photos from 1979-2004 were destroyed in a fire last year, along with my memorabilia. That means, that of the stuff I have , it isn't as vintage as other peoples. I have a lot of stuff,but this one hurt when I saw it. This is supermodified driver Mike Lichty driving a champ car at Oswego in August 2008. 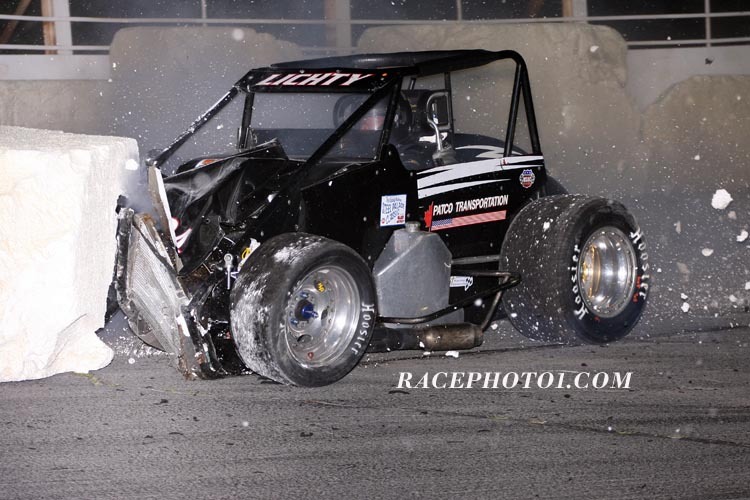 Hit the boiler plate in turn 1 nearly head on. Fortunately he hit Styrofoam block first. Still destroyed the car. He did walk away, very slowly. 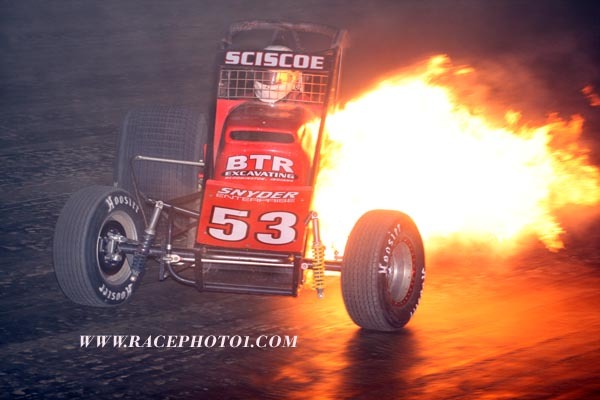 Fire always gets attention, Jon Sciscoe at the 2009 Eldora 4 crown, blowing a motor. I remember seeing your fire on another site, talk about heart breaking, what a loss. Your stuff is always welcome on here, no matter the "vintage". Funny how things work out. May 3rd 1964 my dad (Chuck Hulse) had a terrible sprint car crash at New Bremen that kept him out of racing for 2 years, and he lost his ride with Dean Van Lines and was replaced by Mario Andretti, who actually started my dads accident. When Rutherford crashed at Eldora, his chief mechanic, A J Watson didn't have to look too far for a replacement for the seaon. He needed an experienced driver who could handle both pavement an dirt. My dad had driven his sprint car a few times in 1961and half of the 1963 season. Fortunatly my dad had just passed his physical, and went on to have a pretty good year finishing 7th in points. Lee, not only having a dad (your dad) race in that era and having grown up in that era, your insight to these moments in racing history are fascinating!! Most of us only got to read about that era of auto racing. Mccluskey, Foyt, Jones, Hurtibise, Hulse, Marshman, Branson, White, Crowe, Andretti, Stapp, Rutherford and maybe and Unser. That line up amazes me to this day. From Rowley Park Speedway (1949-1979), Brompton, South Australia. (Adelaide's pug hole). Kym in about 1956 getting air time at RPS. He suffered a injured vertebrae in the neck. The late Bill Wigzell (1930-2012) passes "underneath"